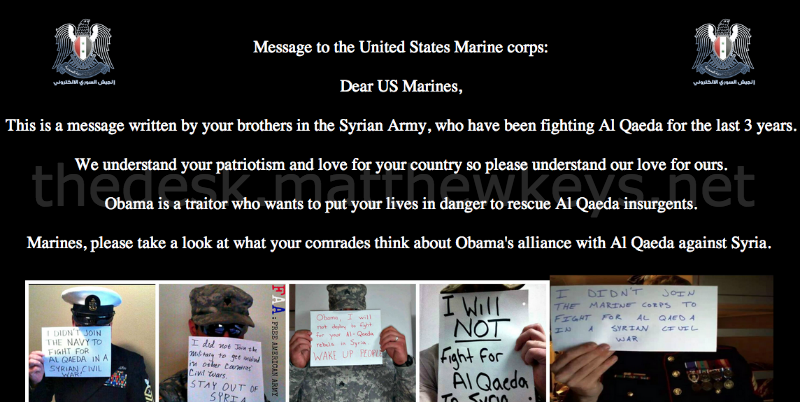 The Syrian Electronic Army has claimed credit for a cyber attack on the recruitment website of the United States Marines. The website was changed late Sunday evening to display a message encouraging U.S. service members from rejecting orders to carry out operations in Syria. The defacement also featured at least five photographs purporting to be U.S. military personnel holding signs denouncing future military involvement in Syria; several of those pictured drew parallels between U.S. military involvement and the al-Qaeda terror network (The Desk could not authenticate the photos). A hacker with the Syrian Electronic Army confirmed to The Desk that the group was responsible for the defacement. The Desk was unable to access the defaced website without the use of a proxy service. The website is used by the United States Armed Forces as a recruitment tool for prospective Marines. The site offers historical information, photos, videos and eligibility requirements among other resources. The official website of the U.S. Marines, Marines.mil, appeared to be unaffected by the cyber attack. On Saturday, U.S. President Barack Obama said he would seek congressional approval for military action in Syria in response to the Syrian government’s alleged use of chemical weapons against civilians. The announcement came days after lawmakers in Britain voted against military action in response to the incident. The Syrian Electronic Army told the website Mashable that it would target more website if the United States launches an attack in Syria. “The moment the US government breaks international law by attacking the sovereign state of Syria, it has given up any rights to complain about being targeted by us or any other group around the world,” the unidentified hacker told Mashable by email. In the past, the group targeted Twitter profiles for various western news organizations, including the Associated Press, ITV News and Thomson Reuters. Last week, the group caused the website and the mobile apps of the New York Times to go offline for hours after it successfully compromised the domain name registration service used by the paper. The group recently threatened VICE after a sister-publication, MotherBoard, published an article purporting to identify one hacker known as Th3 Pr0. The hacker told The Desk that VICE had erroneously published the name of an “innocent friend.” The group said it would forcefully remove the article if VICE didn’t retract their report. The reporter who wrote the article for VICE has not returned an email from The Desk seeking comment.